At noon class Monday Goto Sensei set aside some time to demonstrate the components of the first jo suburi, Choku Tsuki, as Hitohiro Saito Sensei had shown it at the seminar last week. 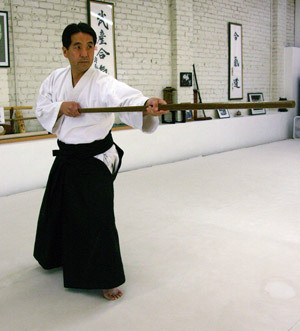 Since Saito Sensei's visit, we've been working on the suburi, almost to the exclusion of everything else in the weapons curriculum, just to make the details he stressed feel more natural. 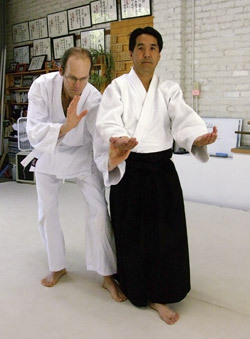 In the first photo Goto Sensei is adopting the opening stance. His feet are in the close hanmi Saito Sensei prescribed, and his body is aligned, relaxed, and open. The second photo shows the trick of angling back the lower part of the jo so that it can be captured by the right hand as the left foot enters forward. This was the move that caused so many lightbulbs to flash across the faces of students at the seminar. It meant that there would be no need to reach awkwardly with the right hand to grasp the jo at the beginning of the move. What is important, Saito Sensei emphasized, is that the body movement and jo capture occur at the same time, as one move. The next photo in the series demonstrates the drawing back of the jo with the right hand, which has slid to the back end of the jo. The jo swings back so that eventually the left hand guide has slid all the way to the front of the jo. Finally, as both hands find their respective ends of the jo the right arm/hand snaps the jo into the thrust, the right hip swings around to the rear and the body finds Hitoemi posture as the thrust completes, radiating zanshin. 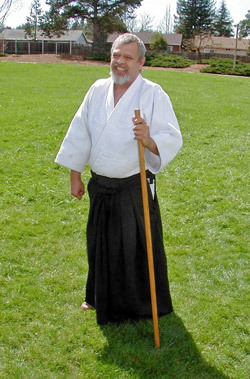 The last photo is a shot dead on from the front, showing Goto Sensei occupying the single plane which characterizes Hitoemi. After the seminar with Saito Sensei I had whined a little bit, complaining that, while it was great to see Saito Sensei, we are always only able to barely scratch the surface before he is gone until the next visit. In the back of my mind I was aware that students who want more exposure can always visit Saito Sensei's dojo in Iwama. Meanwhile, Tatoian Sensei replied, "if you simply practice the fundamentals that he shows in these short visits, then you'll have a built a stronger basis for more advanced training, and you'll pick up more next time he comes around." The Bay Marin Aikido dojo was empty this morning, just half a day after 100-odd aikidoka bowed out with Saito Hitohiro Soke to end his two-day seminar in Northern California. I had expected students to show up for noon class today with renewed enthusiasm, ready to practice what we had learned over the weekend, but as the noon hour chimed the parking lot remained empty. Perhaps people were tired and sore, though the ukemi we took over the weekend was rather tame. With so many people on the mat most of us didn't even complete our throws, being satisfied simply to take uke to a point of unbalance. There were exceptions to this. During the Sunday afternoon hanmi-handachi segment, Daniel Brasse and another sempai repeatedly slammed one another into the mat to finish a devastating kokyu-nage. I was training with Simone right next to them well within their blast radius, and the shock waves from their collisions with the mat were palpable. It was fun to watch. Meanwhile, at the dojo today, I turned to practicing some of the fine points of the jo suburi that Saito Sensei had shown us during the Sunday morning buki waza class. Saito Sensei broke down "choku tsuki" and "kaishi tsuki" into component elements that made them seem accessible instead of magical. Both suburi require grasping the jo with the right hand during the initial movement, and I'd never felt able to get my right hand on the jo quickly enough without rushing. 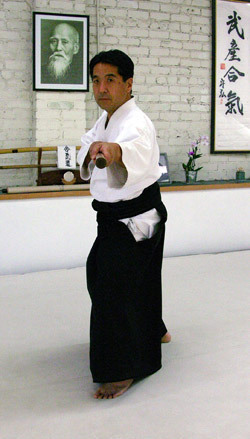 Saito Sensei showed that, as you initiate choku tsuki, if you raise the jo angling the top forward a bit as the left foot steps, then the shaft of the jo can fall directly into the right palm at your waist. This slight angle of the jo allows you to skip the bad practice of reaching past your center with the right hand to get hold of the jo while it is still vertical. The trick with kaishi tsuki embodied the same idea, but this time you angled the top of the jo slightly back as you step forward into hitoemi posture. This lets the right hand come over the top of the jo and draw the weapon back in one economical, fluid motion. The wrong, klunky way I'd always practiced this was too slow. I had always reached over with the right hand while the jo was still vertical and anchored to the mat. But anyone who has ever practiced kumijo #1, or the 31 kumijo, knows that this method will make you late answering the attacker's initial thrust 100% of the time. I spent about 10 minutes today working on these two suburi, trying to make the movement one peice and fluid. I had some difficulty swinging the jo into the thrust the way Saito Sensei had shown. Another lightbulb had gone off Sunday morning when Satio Sensei demonstrated renzoku uchikomi, a suburi involving a shomen strike followed by a yokomen strike. I had always executed the yokomen strike portion as a big circular cover and strike in which the tip of the jo would describe a large circle like a wheel rolling forward. But that's not what it is. After the initial shomen strike the jo recoils back over the head in a much more direct path to become parallel with the spine, chambering the second strike. It's yokomen because you are targeting the attacker's right temple and you are stepping just offline to the left while the right hip swings back and the feet find hidare hanmi as the strike lands. Later I asked Tatoian Sensei if this was a new development, and he looked at me blankly as though I'd asked him if the sun rising in the east was new. "No," he shook his head, "it's always been that way; same thing with #5 ken suburi." I flashed my memory to last May in Lake Tahoe when Saito Sensei was showing us the ken suburi. He had shown a very direct route for the ken on repeated strikes in which the tip of the sword snapped back to his spine. I'd seen it then, but not actually understood what was happening. On the empty mat today I ran through renzoku uchikomi a number of times, trying to snap the jo back for the second strike without making the big circle. It felt awkward. Work in progress. It's remarkable that fundamental movements like this can seem like an unfamiliar surprise, yet I suppose that seeing the same things differently is a mark of learning in progress. Saito Sensei had shown another trick, one that I'd actually noticed last May, that makes the third jo suburi, ushiro tsuki, not so difficult. The suburi is a backward thrust, and you have to get from facing forward with the jo vertical in the left hand, to hitoemi posture looking and thrusting to the rear. The trick was, as you initiate the move angle the right heel backward about 40 degrees. This opens up the hips and creates a path for the left hip to rotate back into hitoemi. This was not easy at first because I'd always done this suburi with my weight more over the front foot, and rotating the right heel back required equal weighting on both feet. I made the adjustment and practiced it until it felt more natural. Saito Sensei placed a great deal of emphasis on "Hitoemi," (which he pronounced "Shto'emi") or the single-plane posture in which we finish thrusts and strikes. He showed how this precise posture is achieved at various junctures during the course of executing a suburi, and not always at the end. For instance, tsuki gedan gaishi hits hitoemi at the end of the thrust and at the gedan position after the jo is drawn back. 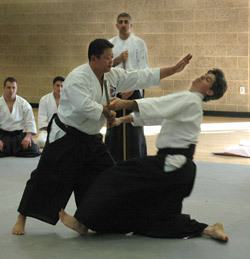 At Bay Marin Aikido we have a picture of O-Sensei slicing into hitoemi right up the center of his attacker. 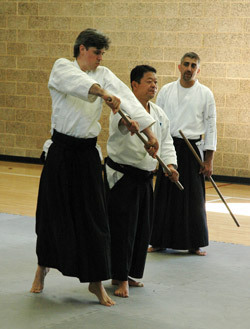 It is the same posture that Saito Sensei demonstrated repeatedly throughout weapons class Sunday morning. 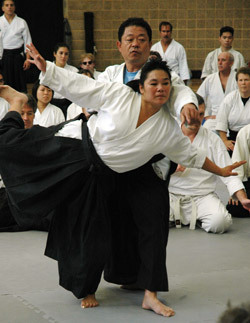 If there is any single posture that identifies someone as a practitioner of Iwama Aikido, for me, it is Hitoemi. It would be a safe assumption that Tai No Henko, our most fundamental technique, would be the glue that held together a seminar with Saito Sensei. Repeatedly, during both weapons and empty-handed practice both days, he would remark that we could check the correctness of our position with how close it corresponds with that of Tai No Henko. Tai No Henko finishes exactly as a sword strike does, he explained for probably the millionth time. "The feet are in hanmi at the finish and not too far apart." If the back foot lands too far back, a common mistake, "then you're not prepared for the next attacker," he cautioned. Repeatedly he would show the zanshin finish of Tai No Henko, and then the finish with the sword. Identical. At lunch a few of us who'd trained with Tatoian Sensei reminisced about entire classes devoted to Tai No Henko. After about 20 minutes, during these classes some kohai would always begin glancing around at Sensei and the other students as if wondering when we were going to get on with some real Aikido. "If you don't get these basic movements right, you'll never be able to do anything more advanced," Saito Sensei warned repeatedly over the course of Saturday and Sunday. 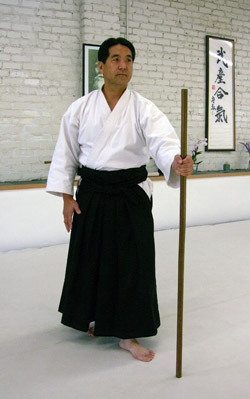 So, from the beginning Saturday, we practiced Tai No Henko and then Morote Dori Kokyu Ho following his instruction on where the feet should go, how far the hips should rotate, and how the throws are just like sword strikes. By mid-morning Saturday we'd advanced through Ikkyo Omote to Ikkyo Ura, but most of us were not practicing Ikkyo Ura the way he wanted. "Dame! Dame! Dame! Dame!" he shouted, punctuating each "Dame" with a finger thrust toward some location on the mat. He broke it down into two components: first draw out your opponent's shomen strike, step in toe to toe, and extend your opponent's elbow down to take his balance; then strike down at an angle to the side to guide uke to the mat. This involved no tenkan move involving the rotation of the feet back behind at the finish the way we usually practice Ikkyo Ura, it was just a simple diagonal strike to the mat. He'd shown this at Lake Tahoe last May also, and I'd even got a chance to feel it taking ukemi from him. It was a more direct and economical path to the mat. Once again he stopped us during the series of Irimi Nage techniques with which we ended the Saturday morning session. Everyone seemed to want to do the flowing, twirling version of Irimi Nage, which is a more advanced form. 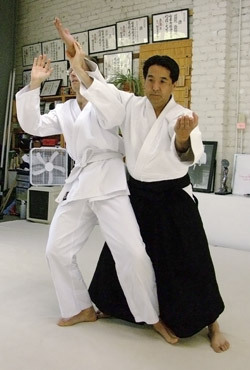 In contrast, Saito Sensei had asked us simply to perform the basic version, in which nage enters behind uke, turns to face uke's direction in a matching hanmi, and then steps directly through for the throw. (I remembered how Goto Sensei had shown how the two forms of Irimi Nage are identical and work from the same principle during a Memorial Day Gasshuku class some years ago.) Saito Sensei reminded us that if we didn't get the basic version right we'd never be able to execute the turning variation. 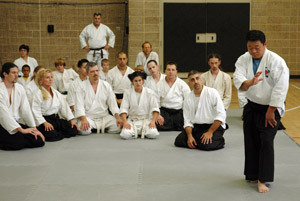 At the end of the seminar on Sunday afternoon, Saito Sensei spoke at length about posture. 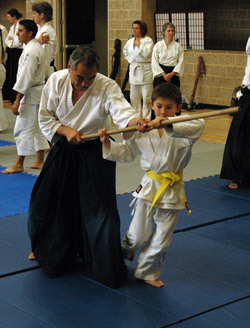 He acknowledged how in his father's later years Saito Sensei Senior had finished sword strikes with his back more or less straight and vertical. But he explained that his father had not always done this. 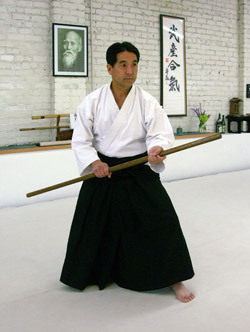 As a younger man, Saito Sensei explained, his father would sink his body into the strike finish, cocking his hips and leaning forward into the strike as his zanshin radiated out. As he said this, I looked around at Tatoian Sensei nearby. 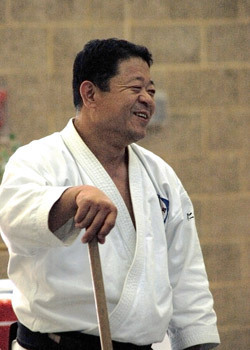 He was nodding solemnly, as though remembering a younger Morihiro Saito Sensei during the early 1970s finishing his strikes in the same fashion as his son was doing over the weekend. 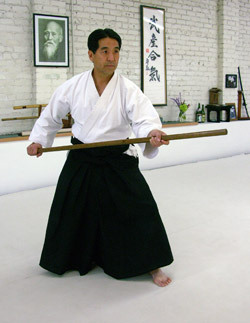 As the noon hour progressed today I turned from jo suburi to a few partner practices Saito Sensei had shown, first taking the defender role and then the attacker, performing them in the air. This method of solo practice has helped me remember partner practices, even though I may go long periods between having actual partners to practice with. On Sunday afternoon we'd done a few jo dori, and at least one of them I'd never seen before. The one I wanted to remember began in gyaku hanmi, and it involved a step offline and a capture of the jo with the front hand palm up. Then, always drawing uke's momentum forward, nage would enter to the opposite side into a kokyu nage throw. 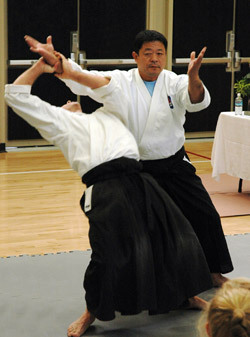 The photo shows Saito Sensei demonstrating a variation in which the throw goes straight up uke's center. 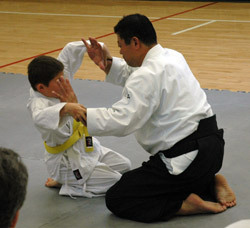 As the Saturday morning class closed Saito Sensei demonstrated Suwari Kokyu Ho with a few of the children who trained at the seminar. The kids trained with the adults during the sessions, except during the weapons class where they gathered off in a separate area of the outside courtyard for safety. Finally, it was time for me to leave the dojo and get on with the day. I packed up my weapons and folded my hakama, and then for some reason reached into my gi bag for the new Iwama Shinshin Aikishurenkai Passport I'd purchased over the weekend. I read the words, "This passport certifies that the bearer is a practitioner of Iwama shinshin aiki." I liked the sound of that and hoped that someday it would be true. I arrived early at the Cotati Hub Park, where we have Sunday weapons practice during the dry season, and pulled into a parking space. I was there a little early on purpose, so that I could do some catching up with Tatoian Sensei about his trip to the Phillipines, and as I looked in my mirror I saw his familiar pearl Toyota swing around the corner into the lot. He didn't look so good, and as it turned out he'd had to have a wisdom tooth pulled while he was out of the country. The operation had apparently caused some nerve damage, and he was in some pain from this and a few other ailments. The picture shows Dennis Sensei on another Sunday morning a few years ago, when he was feeling a little better. Strangely enough, today nobody else showed up for class, even though Carmen and Candy had been regulars while Sensei was gone. He said, "maybe word got around that I was feeling so bad, and nobody thought there would be class." Forgetting about class, I asked him about his trip, and he pulled out his laptop, booted it, and began a slide show of pictures he'd taken in and around Manila and the area south of Manila where he hopes to build a dojo. A whole section of the slide show was devoted to the inside of a food store, and as each grocery item appeared on the screen Sensei would say how much it cost. Up came a bunch of bananas; "a kilo of bananas cost about 30 cents," he said. This went on until I'd mentally spent about $10.00 US, which at Manila prices would have filled up two shopping carts. I guess you can live cheap in the Phillipines. He talked about the half-acre of land he has picked out, and about his plans for a couple of buildings. I asked him how soon this could all come together, and he replied that he'll know more after short trips in November and next January. But, he said, he could be moving there as early as next summer and as late as a year from then. As the sun rose higher over the Cotati Fire Station across the street, Sensei said he had to be getting back home, probably for a new dose of pain medication. It had been good to hear his voice and listen to his ribald stories of life in Manila. Secretly I was envious of the many young men who will travel to train at his dojo once he is established there. I'm sure that there will be many delights beyond those of training with an extremely accomplished exemplar of Iwama Takemusu Aikido. It's been about two weeks since Tatoian Sensei went to the Phillipines to give a series of classes, and even though he is supposed to be back in Northern California this week, there remains a feeling of impending change around the dojo. This feeling is fueled by the growing certainty that eventually Tatoian Sensei will move permanently to Manila. What will happen to the dojo when he leaves, nobody knows. In Tatoian Sensei's absence classes have continued, and today Eric, Craig, and I spent morning class cycling through the kumi jo. The mood was a little subdued, and practice was unusually quiet. I think we were all missing Sensei, and at the same time becoming aware of how different it will be when he is gone for good. It was nice, however to spend the morning working out with two old friends. We had all three been kyu-ranked students together back in the Rohnert Park dojo from which we were evicted five years ago. All of us had gone in different directions then. Eric went off the study karate with Herb Cody, and Craig joined Richard Heckler Sensei's Two Rock dojo in Petaluma, while I gravitated to Goto Sensei's dojo in San Rafael, CA. Since Tatoian Sensei has been teaching again, however, we all seem to have drifted back to train somewhat regularly with our old teacher despite our affiliations elsewhere. Now that his move away seems all but certain there is a strange, hollow feeling around the dojo. The good news surrounding Tatoian Sensei's relocation is that he will be closer to Iwama and the potential for greater collaboration with Hitohiro Saito Soke in Japan. This will certainly mean good things for Iwama Aikido in the Phillipines, and it will mean good things for us here in the US when Tatoian Sensei returns to visit. Meanwhile, we will continue to train together and laugh about times gone by while moving directly into the center of an uncertain future. 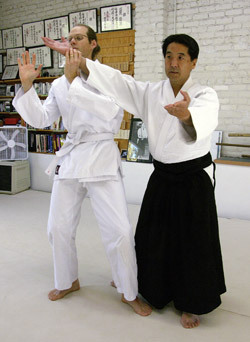 "It's just like magic," winked Goto Sensei, in the middle of explaining how to make a simple Kokyu-ho work from a katate-dori, one-handed wrist grab. We had been struggling. 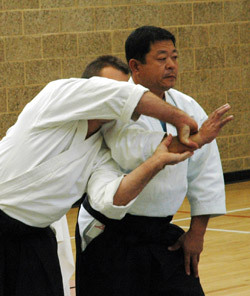 The technique involves stepping in beside uke while keeping the grabbed hand extended, sort of like Tai No Henko, except the feet are reversed for Kokyu-Ho instead. Then nage raises the grabbed hand and strikes through uke to execute the throw. Our trouble was that we were, as usual, just throwing with the arm, and this results in forcing the throw. Either uke gets whacked in the face, or clotheslined across the chest by the swinging arm. Neither of these outcomes is conducive to a lasting peace. Goto Sensei was telling us that extending and raising the grabbed hand is only the visible part of the technique, and that much of the function of this hand is for misdirection while something else more important takes place. Very sneaky. He said, "a great magician is someone who does a trick, you know what he is doing, and you still can't see it." In this technique, he continued, the raising hand captures uke's attention while the hip and shoulder sneak in right next to uke's body. That's the tricky part. So that when the hand is ready to strike through for the throw uke's body has already been unbalanced by the surreptitious hip and shoulder adjustment. When it's happening right, Goto Sensei said, the hand is extending and raising while the hip is moving back into uke's body. This conforms nicely with the basic Aikido strategy of moving in opposite directions at the same time. 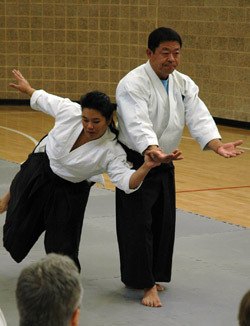 In the picture series, Goto Sensei shows first the beginning posture after the turn, but before the throw. In the next photo he shows how an improper arm-only throw leaves space where the hip hasn't moved in. Finally he shows the same posture but the hip has moved in while uke was kept occupied by the raising hand. Both nage's and uke's whole bodies have moved instead of just the upper bodies, and uke becomes light. We tried it out, extending and raising the grabbed hand while snugging the hip up alongside uke's body. Voila. Folding uke. Of course, done properly, it's all one movement instead of the herky-jerky, stop-start method we used to make sure we were doing all the parts. But eventually we'll be able to do the sleight-of-hip thing and people will wonder how come uke fell down.